Definition at line 45 of file sampleCompTop.cc. Definition at line 53 of file sampleCompTop.cc. Referenced by sampleCompTop(), and sampleTopLeftWithGridLine(). Definition at line 80 of file sampleCompTop.cc. 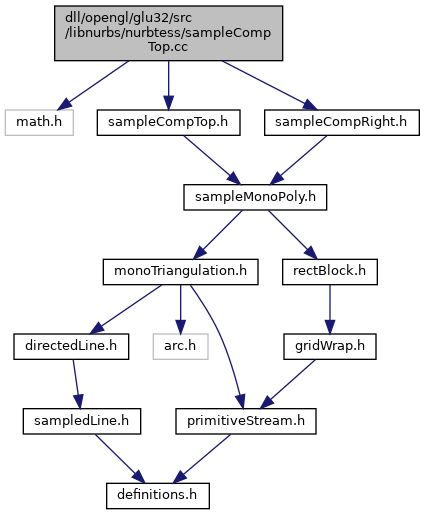 Referenced by sampleCompTop(), and sampleTopRightWithGridLine(). Definition at line 326 of file sampleCompTop.cc. 357 //if left(i) is higher than right(j), then the two chains beloew right(j) are separated. 358 //else the two chains below left(i) are separeated. 366 if(i<leftStartIndex) //left chain is done, go through remining right chain. 380 break; //the for-loop. below right(k-1) is seperated: oldLeftI, oldRightI. 404 if(leftChain->getVertex(i) > leftMax) //update leftMax and newLeftI. 409 for(k=j-1; k>= rightStartIndex; k--) //update rightMin and newRightI. Definition at line 771 of file sampleCompTop.cc. 838 //inc_chain[i] and dec_chain[tempI] are connected. Definition at line 286 of file sampleCompTop.cc. Definition at line 196 of file sampleCompTop.cc. Definition at line 158 of file sampleCompTop.cc. Definition at line 107 of file sampleCompTop.cc.